Cold winter weather is upon us! The following safety tips courtesy of WKYC/WKYC.com in Cleveland could save your life when winter weather threatens. Blizzard Watch: Conditions exist for the possible occurrence of sustained or gusty winds of 35 mph or more are expected to reduce visibility at or below a quarter of a mile for at least three hours. Usually issued 12 to 36 hours in advance of the start of blizzard conditions. Blizzard Warning: Issued when sustained or gusty winds of 35 mph or more are expected to reduce visibility at or below a quarter of a mile for at least three hours. Usually issued 6 to 18 hours in advance of the start of blizzard conditions. Winter Weather Advisory for Snow: A fall of snow within 12 hours of usually 3 to 5 inches. Wind Chill Advisory: Wind chill temperatures are expected to be -10° to -25° Fahrenheit (F) for an extended period of time. Wind Chill Warning: Issued for wind chills below -25° Fahrenheit (F) for an extended period of time. Sleet: Solid grains of ice that form from rain that freezes before reaching the ground. These pellets of ice tend to bounce upon contact and may accumulate enough to cover the ground, even to the depth of several inches. Dense Fog: Visibility is reduced to one quarter mile or less over a widespread area. Heavy Snow: Six inches or more of snow in 24 hours for widespread snow and six inches in 12 hours for lake effect snow. Don't forget the animals during a winter storm! Most animal deaths during a storm are caused by dehydration from frozen water. A temperature of 10° Fahrenheit (F) or below is too cold for any pet to tolerate. The physical stress of cold temperatures can make pets more susceptible to illness or infection. Remove ice, salt and caked mud from your pet's paws and coat right away. Contact your veterinarian immediately if you suspect your pet has frostbite. Frostbitten skin may turn reddish, white or gray and it may be scaly or sloughing. Don't use metal water dishes outside as your pet's tongue could stick to the frozen metal. Winter holidays can be a joyous time for all, but nearly 50 percent of civilian fire deaths occur throughout the winter season: November to February. Most heating fires involve fireplaces and chimneys. The most dangerous place to be is in your home. Your home can be a cozy, warm place away from a harsh winter, but it can also become dangerous if you don't take special precautions. Keep children, pets, holiday decorations and loose clothing at a safe distance around heating equipment. Always turn off portable heating appliances when leaving home or retiring for the evening. Be sure the fire in the fireplace is out before going to bed. Use a sturdy screen or glass closure in front of your fireplace, and burn only clean firewood. Never burn treated lumber. Install smoke detectors on every level of your home, including the basement, and test them monthly. If you smell gas in your home, contact your local utility company or qualified professional heating contractor and follow their advice. Inspect heat tape before using it. Never thaw frozen pipes with an open flame. Place candles on a secure surface in sturdy, non-combustible holders that won't tip over. Make sure holders are large enough to catch drippings. Keep candles away from children and pets. Candles should be out of children's reach. Keep candles away from combustible items such as curtains, books and paper. Remember the "three foot rule" – anything combustible needs to be kept at least three feet away from a heat source. Keep candles away from flammable liquids. Do not use a candle for light when fueling a kerosene heater or lantern. The flame may ignite the fumes. Avoid using candles during a power outage. A flashlight is a safer option. Don't carry a lit candle. Remember to extinguish candles when leaving the room or going to sleep. Never leave children or pets unattended in a room with a lit candle. 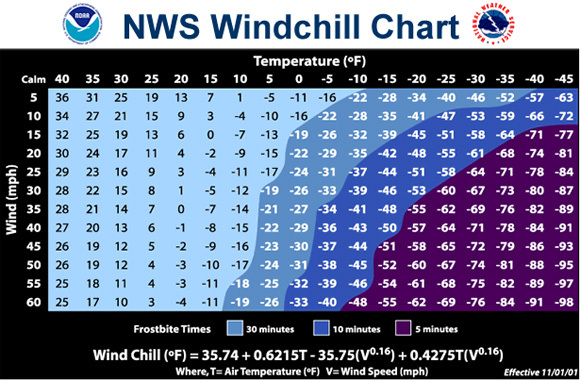 Wind Chill is not the actual temperature, but rather how wind and cold feel on exposed skin. As the wind increases, heat is carried away from the body at an accelerated rate, driving down the body temperature. Animals are also affected by wind chill; however, cars, plants and other objects are not. Frostbite is damage to the body tissue caused by extreme cold. A wind chill of -20° Fahrenheit (F) will cause frostbite in just 30 minutes. Frostbite causes a loss of feeling and a white or pale appearance in extremities, such as fingers, toes, ear lobes or the tip of the nose. If symptoms are detected, get medical help immediately! If you must wait for help, slowly re-warm affected areas. However, if the person is also showing signs of hypothermia, warm the body core before the extremities. Hypothermia is a condition brought on when the body temperate drops to less than 95° Fahrenheit (F). It can kill. For those who survive, there are likely to be lasting kidney, liver, and pancreas problems. Warning signs include uncontrollable shivering, memory loss, disorientation, incoherence, slurred speech, drowsiness, and apparent exhaustion. Take the person's temperature. If it is below 95° Fahrenheit (F), seek medical care immediately!